Every galaxy hosts in its center a super-massive black hole (SMBH) of mass between one million and a few billion solar mass. Since the masses of black holes and galaxy bulges are proportional, it is likely that star formation and SMBH feeding occurs simultaneously and that both bulges and SMBH grow in symbiosis. 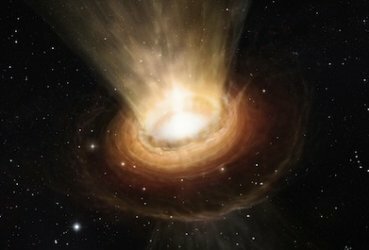 Massive molecular outflows have been recently discovered, in galaxies either actively forming stars or not, but in general showing signs of nuclear activity (AGN). Contrary to previous outflows detected in ionised gas, they contain a large fraction of the gas mass, and are able to impact significantly the evolution of the host galaxy, by regulating or stopping the amount of cold gas available for nuclear star formation, or black hole accretion. Is this evidence of the strong AGN feedback, invoked by galaxy formation models to explain the baryons to dark matter ratios ? Or can this regulate the symbiotic bulge and SMBH growth ? The current observations will be reviewed and compared to models. Françoise Combes is one of the leading astrophysicists in the field of extragalactic astronomy. She has done fundamental work in the area of dynamics of galaxies, on the interstellar medium in extragalactic systems, molecular absorption lines in the intergalactic medium, and on Dark Matter in the Universe. Françoise Combes is professor at the College de France, and researcher at the Observatoire de Paris. She is author or co-author of more than 700 astronomical publications. She received many distinctions : Prix des Trois Physiciens de l’ENS, Officier de la Legion d’Honneur, Silver Medal of the CNRS, and the Tycho Brahe European Prize. She is a member of the French Academy of Science.